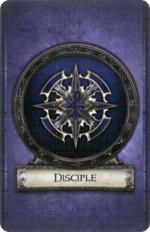 Disciple is one of the class options for the archetype Healer. This class was first introduced in the Second Edition base game. Similar to traditional clerics, Disciples specialize in healing their allies and punishing their enemies with divine justice. Starting equipment for a Disciple is an Iron Mace, a Wooden Shield, and the skill Prayer of Healing. Armor of Faith 1 Each time you use Prayer of Healing on a hero, that hero adds 1 additional brown die to his defense pool until the start of your next turn. Divine Fury 2 Each time you use Prayer of Healing on a hero, that hero adds 1 additional yellow power die to his attack pool on his next attack this round. Prayer of Peace 2 : Exhaust this card. Disciple starting skill Prayer of Healing. Disciple starting weapon Iron Mace. Disciple starting shield Wooden Shield. Disciple skill Armor of Faith. Disciple skill Prayer of Peace. Disciple skill Time of Need. This page was last modified on 24 November 2018, at 10:52.